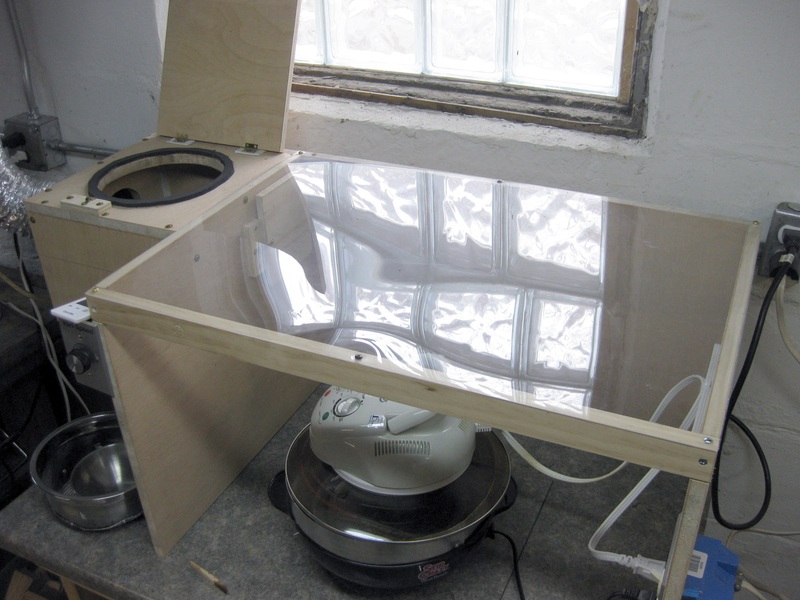 I wanted to build a Turbo Oven roaster and use it in my basement but not fill my house with roasting smoke. 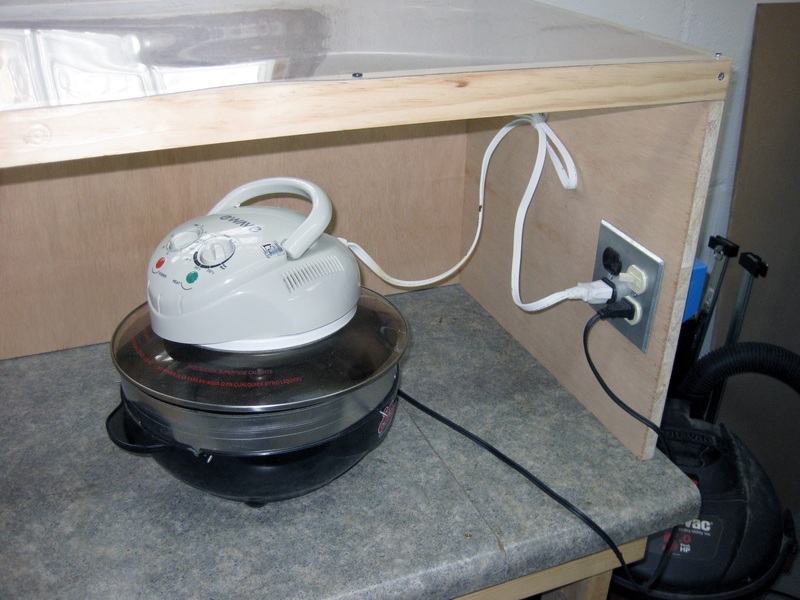 With my previous Behmor setup I had ducted the unit outside using a blower so I would just need to build something to capture the smoke. Enter the roasting hutch, or vent hood. It’s a hood that goes over the roaster allowing for smoke to be pulled outside. In addition I’ve added a cooling chamber to the design to take advantage of the fan. At the end of the page I will try to list all the materials used and sources if possible. 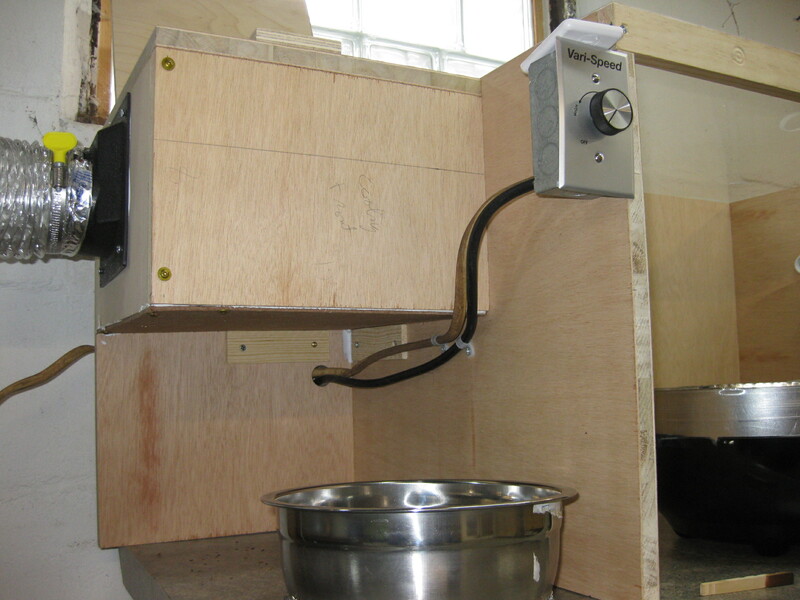 The body of the hutch is 3/4″ plywood and was assembled with cabinet screws. The top piece is thin plexiglass which was used just to let more light in. The door hinges and latches are light brass hardware I got from a big box store. The seals are made out of 1/4″ neoprene that I had leftover from a kayak repair. 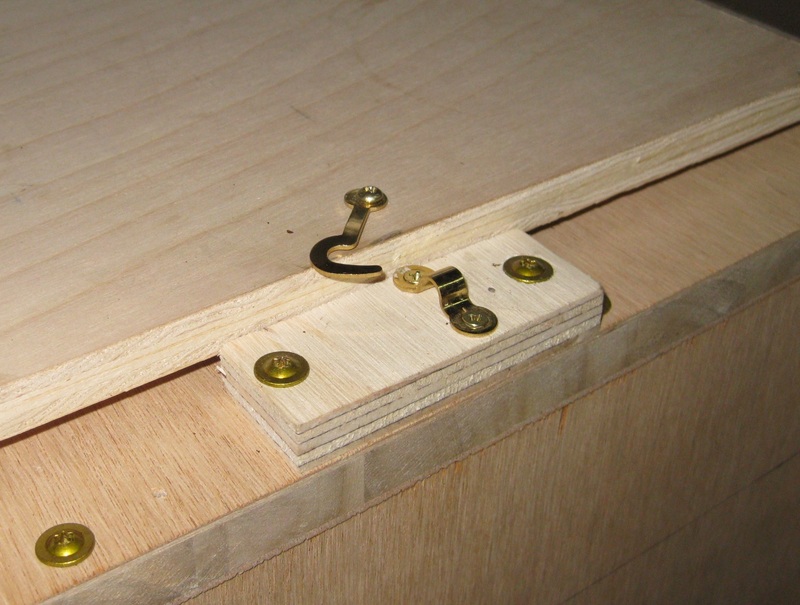 As you can see I had to shim the hinges up a bit to let the door close more easily. The folded-up paper started as as test piece but wound up being the permanent solution. 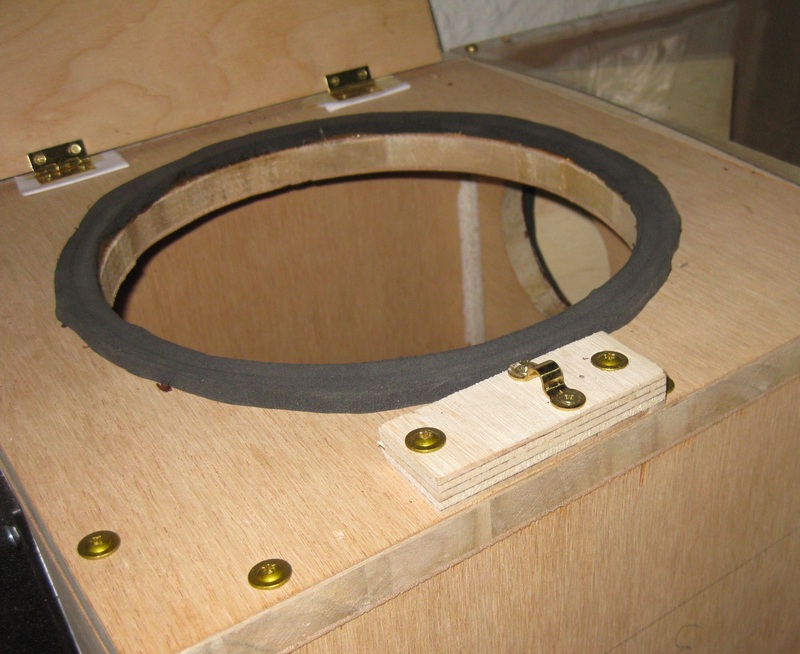 I caulked the interior corners of the cooling chamber just to avoid any leaks. The hole was sized to match the stainless bowl I used for the cooling colander. The lip of the bowl fits nicely over the door seal forcing all the air to be pulled through the hot beans. The airflow is controlled by the two doors in the above photo. While roasting the cooling door is closed and the interior door is open. 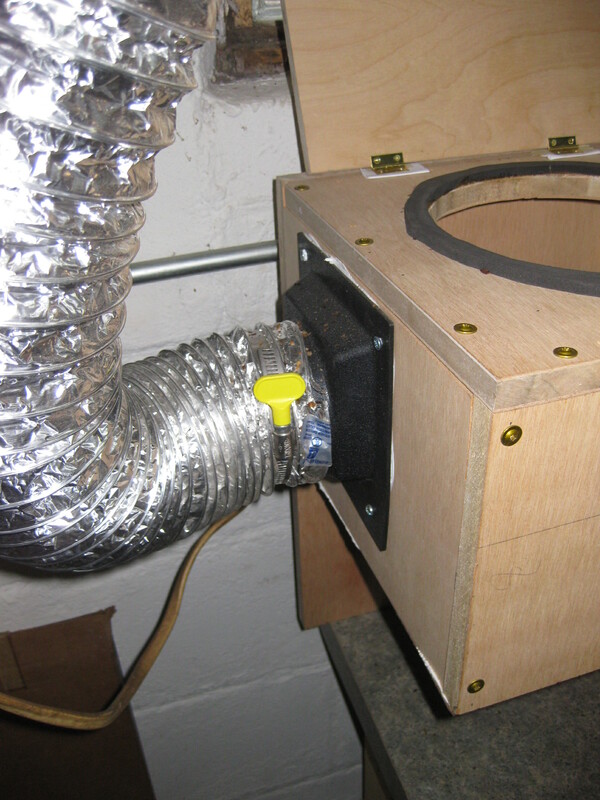 This allows the blower to pull air through the chamber, evacuating smoke. 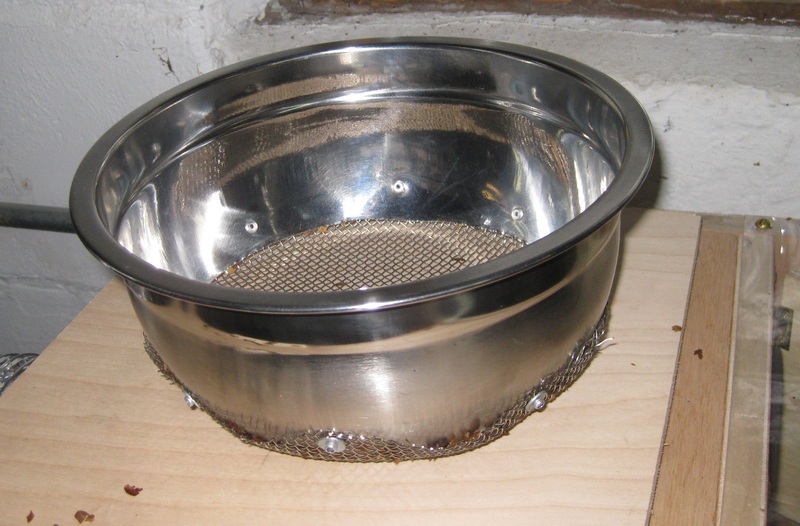 Then the roasted beans are put into a colander which in turn is inserted into the large hole in the chamber’s top. The interior door is closed, letting the blower pull air through the beans. The colander is a 9″ stainless bowl I got from Wal-Mart. I cut off the bottom and riveted on 1/8″ stainless mesh. It’s pretty hideous but it works well. If I could find any for a reasonable price I’d go for a larger hole size in order to let more chaff through. The vacuum from the blower is strong enough to pull out almost all of the loose chaff. I could not find any stainless mesh that didn’t cost $40+ a sheet so I cannibalized a sifting pan. The idea came from another resourceful coffee roaster. I put in an old work electrical box to give a clean, elevated place to plug in the roaster. The right-hand outlet is switch-controlled so that I can shut off the popper’s stir arms. The blower is a 1/20HP shaded-pole blower exhausting out the basement window. 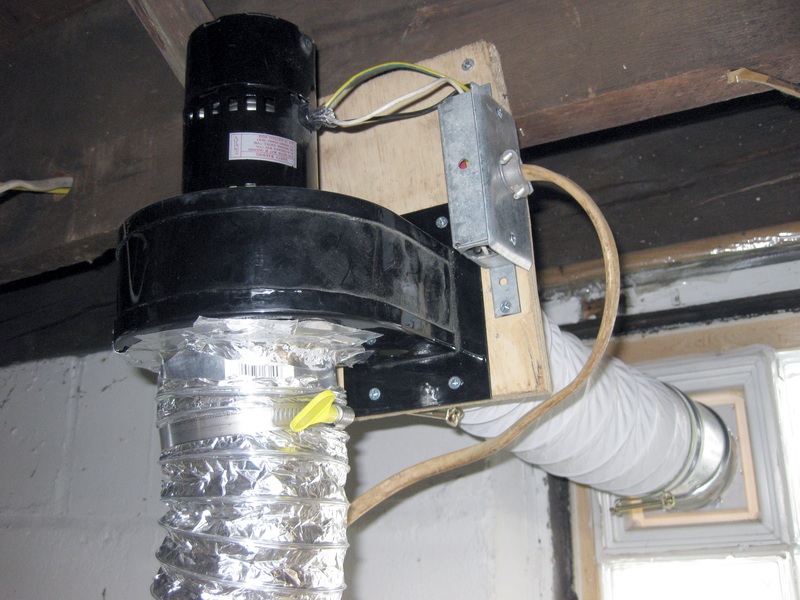 All the ducting is 4″. The blower is kind of loud when running at full blast so I wired in a speed control. While roasting I run the fan at about half-speed which lets me better hear the cracks. Only when 2C comes around do I turn it up all the way; this better captures the smoke from that step and readies the cooling chamber. 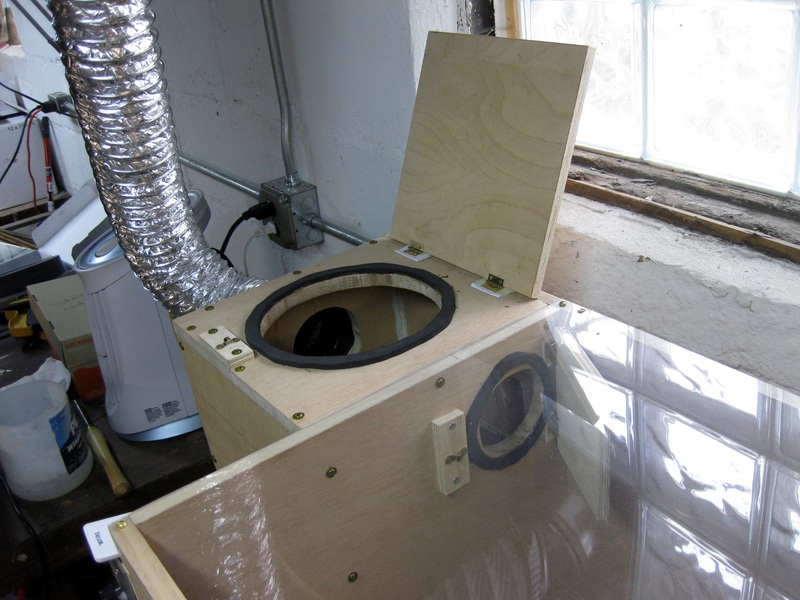 I built a vent hood in my garage using yours as a guide. First roast was last night – went great! I use a Behmor 1600, and for cooling I just remove the drum with beans and put it into the cooling chamber still in the drum, which I can spin manually to remove chaff. It’s great to have a good dedicated space for my roasting, as opposed to lugging everything outside and back in once or more per week. Thanks for the guide!